Tonight I'm off to a few events in the city so I thought I'd wear something that was comfortable but also something that I can wear to more dressy events. Motel are having a press day and AX Paris have a party going on as well. Should be pretty darn good! I hardly go to Fashion Events any more and I really need to change that! 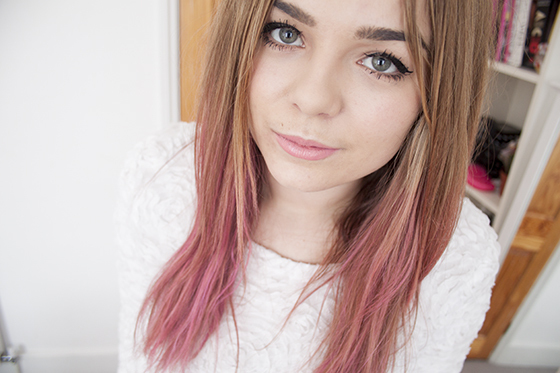 I'm really liking white and how it looks against my pink hair. I think it looks so cool and a fun twist on such a basic colour. 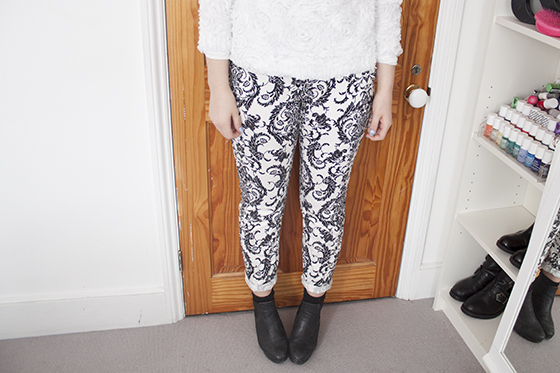 The paisley trousers have quickly rocketed up my list of clothes that I love. So easy to wear and have a nice slouchy fit. I also wore my favourite ebay American Apparel 3d Flowe Mesh Jumper dupe, It's shank a little in the wash but it's still quite wearable, albeit a touch on the snug side! 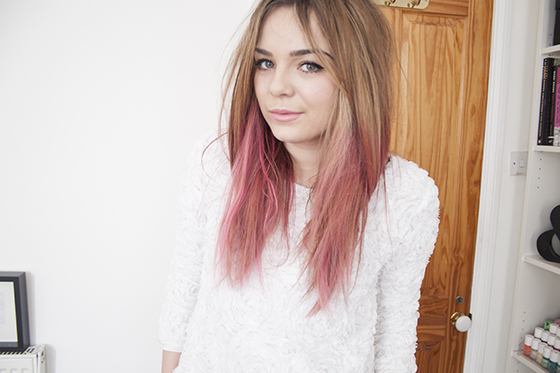 ooh i love your hair so much lily! Love how the lipstick matches the hair... heehee cute! Have a lovely night tonight, amazingly I had my first blogger invite EVER EVER to that AX Paris event tonight but I can't go ("school" night)... shame as I'd love to come and say hi! I'm loving how the white looks too, I need to get my tan on before I dare put this shade on however! lol! I love the trousers! Slowly getting used to your hair and loving it. Take care of your hair thought, it's looking damaged. Not because of the pink, but because you've been dying it for so long. Not trying to interfere with what you do, not at all - I believe everyone does what they want. Just take care of your hair :( 'cause I love it, and I've no doubt you do as well! lovely outfit. and i love your pink hair and your nails. have you done them on your own or did you get them done? Perfect outfit :) love your outfit posts lately, new hair suits you so much as well :)! I love the nails, Lily! I saw loads of pictures on motels instagram of the press day and it looks amazing hope you have a good time! Oh and you look gorgeous! You look gorgeous in the last photo! The new hair really suits you. I don't own anything with paisley print, but I love the look of the black and white print. Really do love the pants, Look lovely, nice that they are from some where afforable too! 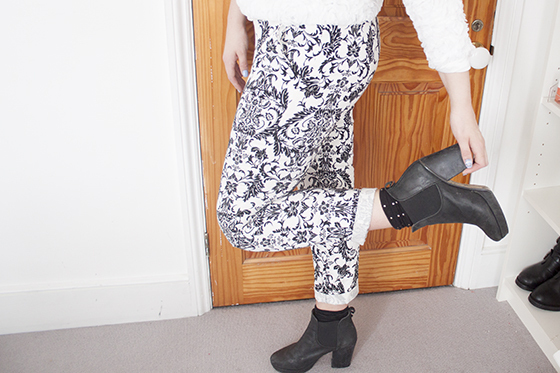 Last year I was on the hunt for the perfect pair of paisley trousers and who knew Primark would deliver the goods! My local Primark is rubbish but I might have to double check if they have them! So spring-y! 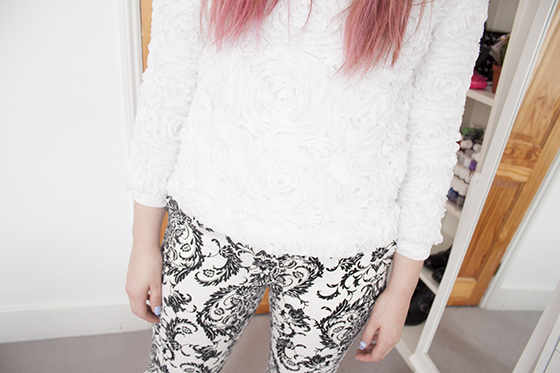 Love the print on the trousers I have a similar on my wallpaper! I would love a blouse with the same print! Forever jealous of those trousers! I love these trousers! Majorly need to keep an eye out for them. And your hair looks uhhmazing! You are just soooo good at styling, you never look bad! I love your hair lilly, I'm contemplating doing the same thing for the summer. You're looks are amazing as usual. Too beautiful , love those trousers. I really need to invest in some printed trousers I think. They are cropping up on more and more blogs and Im slowly warming to them! Stunning!! Definitely my outfit inspiration for today.. I remember lusting over this jumper last year! Omg that jumper is gorgeous, a perfect dupe of the AA ones! Plus I have to get my hands on those trousers...dont look great on the hanger but look fab on! ps loving the pink hair! 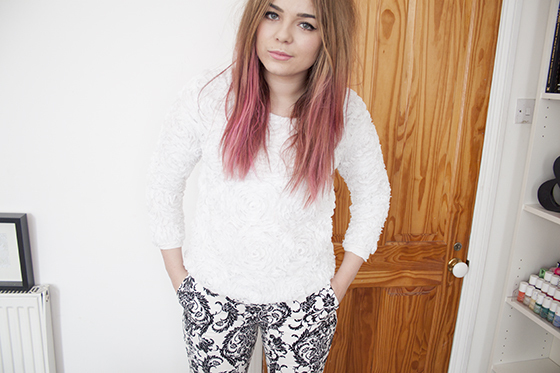 I love the trousers, can't believe they're from Primark! Also I love your hair!! No way are these trousers from Primark! What material are these? They look a bit like a jean... ? need these trousers in my life!! What size did you get the jumper in?? 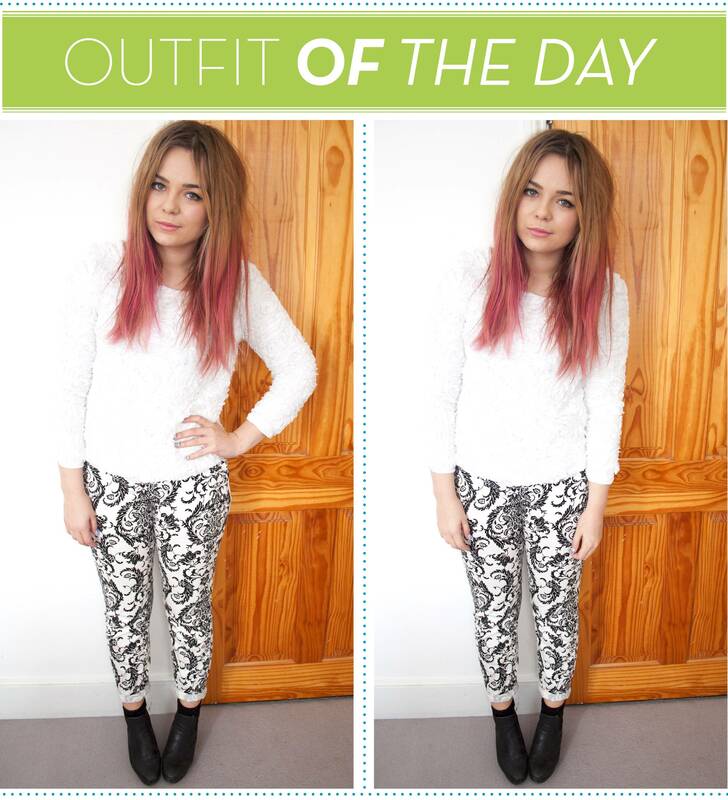 I really want to buy one but not sure if to go for the size 12 or 10.. :/ x Great post and outfit!! its so love to see you in this dressing..
your nail color suits you and its so attractive..thanks for sharing..